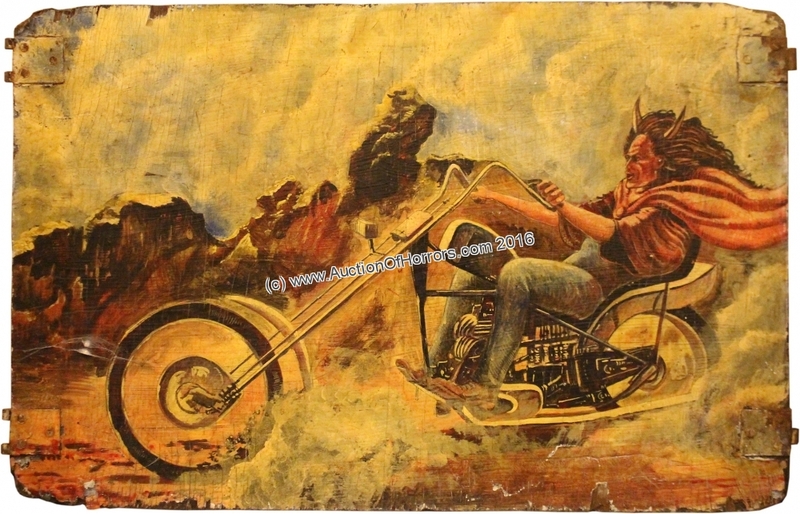 one of eight recently discovered panels, probably from a Easyrider Speedway ride. Fantastic scenic artwork by an as yet unidentified artist. Painted on thin plywood panel, now showing signs of many years use on the fairground and in storage. Unsure of date, but the subject and style looks to be late 1970&apos;s / early 1980s. Distressed condition only adds to the charm. We&apos;ve not tried to clean these due to the fragility of the paint in places, but could be stabilised by carefully injecting thin glue or varnish behind the edges that are flaking, then carefully cleaning, with a fresh coat of varnish applied on top for long-term protection.